Mouse anti Human AOF2 1B2E5. 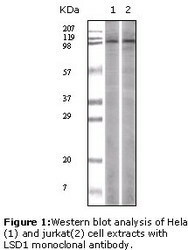 Note: This LSD1 (1B2E5) antibody is useful for Western blot, Immunohistochemistry on paraffin-embedded sections and ELISA. In Simple Western only 10-15 uL of the recommended dilution is used per data point. The amine oxidase domain 2 AOF2 gene encodes a nuclear protein (LSD1,~95 kDa) containing a Swirm domain, a FAD-binding motif, and an amine oxidase domain. 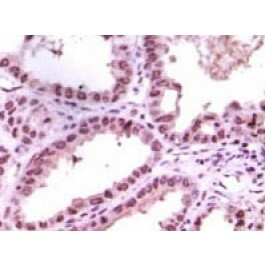 This protein is a component of several histone deacetylase complexes, though it silences genes by functioning as a histone demethylase. LSD1 is a chromatin-modifying enzyme, which serves as a docking module for the stabilization of the associated corepressor complex(es) on chromatin. Shi YJ, Matson C, Lan F, Iwase S, Baba T, Shi Y. Regulation of LSD1 histone demethylase activity by its associated factors. Mol Cell. 2005 Sep 16;19(6):857-64. PubMed PMID: 16140033. Metzger E, Wissmann M, Yin N, Müller JM, Schneider R, Peters AH, et al. LSD1 demethylates repressive histone marks to promote androgen-receptor-dependent transcription. Nature. 2005 Sep 15;437(7057):436-9. Epub 2005 Aug 3. PubMed PMID: 16079795. Store at 4°C short term. Aliquot and store at -20°C long term.